Bridges for Modellers by L. V. Wood provides an excellent resource for modellers on the subject of bridge architecture. Bridges for Modellers is not a how to guide for building a model bridge, rather a guide to the detailed construction of the real thing. The book should therefore be regarded as a reference book to research the detail that needs to be incorporated in a convincing model. The book is well illustrated with lots of black and white photographs and diagrams, along with readable and informative text. It feels a little dated by modern standards, and this is largely because it is a paperback reprint of an Oxford Publishing Co title first published in 1985. 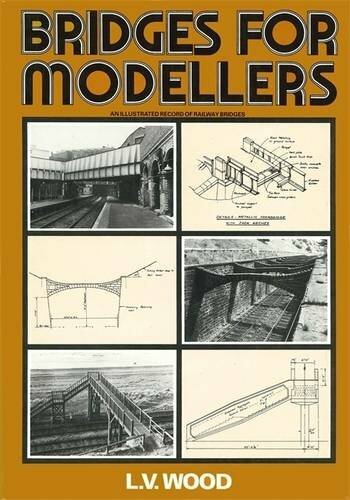 Bridges for Modellers contains details of a variety of British railway under-, over- and footbridges of types which would be the most common to appear on layouts, from the pre grouping era to present-day practice, suitable for modellers in any scale. Constructional details of structures in timber, masonry, brick, concrete, cast, wrought iron and steel are covered to enable models of bridges to be realistically and accurately constructed. In conclusion, a comprehensive book that leaves the modeller with no excuse for producing a bridge that looks as though it has been made out of Lego.